Wheel-chair bound Natiq from Mosul lost a leg to diabetes. His family pushed the 60-year-old for three hours to get out of the war zone. “They blind-folded me and drove me to an Islamic State judge,” 23-year-old Qusay told me as a crowd of displaced civilians gathered around at an IDP camp near Mosul eager to share their stories of life under extremist rule. Qusay’s offense was trying to flee the caliphate of Abu Bakr al-Baghdadi and his jihadist followers, who after they seized Iraq’s second largest city two years ago threw Mosul back a few centuries to barbaric medieval-style punishments. Women were stoned to death for adultery. Dissenters and suspected spies beheaded. Locals guilty of minor infractions of the jihadist "moral code" endured public beatings, others endured weeks in jails and reeducation classes. Walk around IDP camps in northern Iraq, like the rapidly expanding one at Khasir, and it isn’t hard to hear stories about the brutality of the terror group as it set about to build a state of fear. Mosul residents opposed to the terror group tried their best to stay indoors and parents were determined to keep their daughters inside fearful of a jihadist "offer" of marriage. 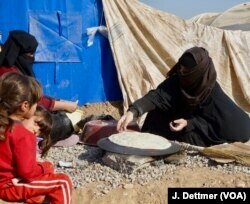 A displaced Sunni Arab family from Mosul. Kurdish officials say they are unsure who to trust in villages captured from ISIS. Qusay said he was lucky he was let go, but warned another infraction would be met with death. The smuggler he paid received a skin-shredding 80 lashes. Talking about the past two years, Qusay’s older brother Mohammed, aged 49 and father of eight daughters, shivered at the memory of the public events IS militants staged in the Mosul district of al-Zahra in their campaign to terrorize locals into observing the group’s interpretation of sharia law and intimidate rivals. “There were a lot of public executions and cutting off of hands,” he said. “And there was a stoning of a woman for adultery. I didn't go, I couldn’t bear to see it,” he added. That was risky. Absences were noticed and when the terror group held punishment events, a district would be closed and traffic halted. Locals were commanded to attend. In recent weeks as the caliphate faces a reckoning, losing territory both in Iraq and Syria, punishments have gotten harsher, according to displaced civilians from Mosul. Under pressure from avenging forces IS propaganda teams haven’t been able to maintain their social media strategy to present the killings to the world. But displaced civilians say there have been crucifixions and the terror group doesn't hesitate to attack those fleeing Mosul. “All the punishments have just increased. So an offense that would have got you a beating, now gets death,” said Qusay. 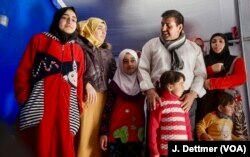 For Mohammed’s daughters, there’s relief of having escaped. All of his daughters were well-schooled before the arrival of Daesh, his 21-year-old wants to become an astronomer, and a 16-year-old is eager to be a painter and showed me a few drawings she brought with her when the family made their dash to escape during a lull in fighting. One drawing is of the Eiffel Tower. “I would love to see Paris,” she said. Mohammed and some of his daughters. He shivers when asked what life was like under ISIS in Mosul. Not all the camp’s residents are happy to see and talk to a reporter. Many are wary; others cast hostile glances. Some of the wariness can be explained by an overall fear, the displaced are traumatized and at a loss. “Some believe even if the Iraqi military does drive Daesh from Mosul, the militants will return. They don't want to say anything that may get them in trouble later,” said a camp resident. But the hostility is another matter. An unfair statement, but as some camp residents told me a large proportion, some say even a majority, of their neighbors welcomed IS militants and backed the extremist regime. It is impossible to calculate how many genuinely embraced Daesh’s ideology and how many were being opportunistic or collaborating to ensure survival. 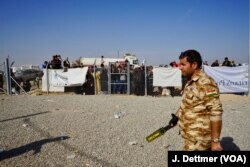 A Kurdish policeman patrols the entrance to the Khasir camp and displaced civilians sure waiting to enter the camp at Khasir. But as Dindar Zebari, a top Kurdish official said Sunday, it is important to remember what many of Sunni Arabs were subjected to by IS. “Sunni Arabs are the victims here,” he said in Irbil. He noted the peshmerga face a constant challenge in working out whom to trust in villages they’ve retaken and who may still be supporting IS. With the Mosul offensive the Kurdistan Regional Government (KRG) has taken some towns and villages on land that has long been disputed between Irbil and Baghdad. KRG President Masoud Barzani and top Kurdish officials insist villages the peshmerga has captured from IS in the "disputed territories" will remain part of the KRG. For now the peshmerga and Iraqi security forces are cooperating in the fight against IS but some analysts are pessimistic the spoils of war will be divided peacefully, arguing ethnic and sectarian interests will push the Kurds and Arabs to clash.